Many people will say it’s rash and risky, but what they don’t tell you is that abandoning your safety nest to follow your passion is also incredibly brave and outstanding. But just because it’s bold and admirable does not mean that you should expose yourself to the dangers of traveling. You can take steps to mitigate the risks and hazards of going on the road. When entering an uncertain situation, careful planning and preparation can make all the difference. That said, keep these tips in mind to fully prepare yourself for the long journey ahead. It can’t be emphasized enough how big of a decision it is to leave your family, friends, and job to travel the world on your bike. You must make sure that you’re making an informed decision. That’s why you don’t neglect to do your research. Know what you’re getting into. Are you physically, mentally, emotionally, and financially ready to take this step? What are the things (e.g., international travel insurance, documents, tools, and supplies) you need to prepare for your trip? What are the possible risks and hazards of touring the globe on a bike? Make sure you have thorough answers to these questions and more before you uproot yourself. Spontaneity is more fun and exciting, but in this situation, having a plan will help you enjoy your trip more. Out there, you have only yourself to rely on. You may as well have the assurance you can get. And a plan is exactly that. You don’t need to create a complete itinerary for every place you’re planning to visit. But you do have to map out your destinations and the routes you can take to get there. There is a right time and a right place to abandon making plans and be spontaneous. But don’t expose yourself to unnecessary dangers. Map out your journey, and include places where you can find food, shelter, and necessities. Make sure you have a fallback in case something goes wrong. Some people like to preach that money, or the lack thereof, should not stop you from chasing your passions. Keep it real, though. You need money to travel. Who will pay for your plane tickets, food, shelter, and other expenses? So you should dismiss those people who will tell you that you don’t need to have money to follow your dreams. Traveling the world on your bike isn’t conducive for making money. You must do it—making and saving money—before you embark on your journey. Evaluate your lifestyle, and see where you can cut corners to save money for your travel. Take a part-time job, or try freelancing. Raid your home for things you don’t need and sell your clothes and stuff online for extra funds. There are many ways to make a killing if you’re willing to work hard. Here’s the sitch. You must be a better cyclist to travel the world on a bike. There’s no way around that. Experience, power, and endurance—all things a good biker has are essential to survive the diverse, sometimes punishing, tracks of the places you’re going to visit. You can only gain road experience by going out there and riding your bike. Similarly, you can only develop your power and endurance by doing the same thing and gradually pushing your limits. Set cycling goals to motivate yourself. You can aim to overcome a century ride or finish cycling race. Set smaller goals too, like slowly increasing your speed by one mile per hour and distance every time you ride. Monitor your cycling progress using performance-tracking gadgets and tools such as power meters, fitness trackers, and cycling apps. These tools can help your training by collecting your cycling stats and giving valuable insights on your performance. On the road, you won’t have the convenience of a repair shop and supplies store if your bike or gear breaks down. That’s why you should invest in high-quality, durable bike and gear for your journey. 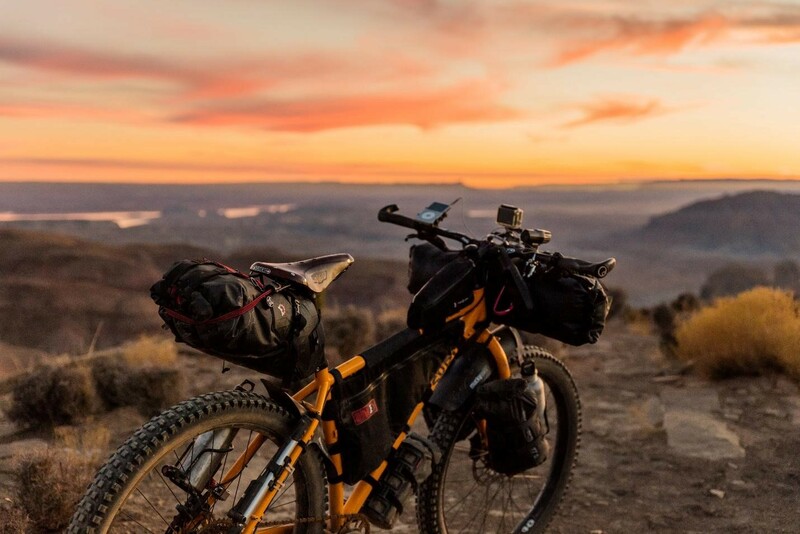 You’re bound to encounter difficult and rough trails, changing weathers, and fluctuating temperatures on your journey, and they can be punishing on your bike and gear. You need a strong, reliable bike and hard-wearing gear that can survive through anything. Chances are, you’ll be constantly on the road. You need to learn how to rough it up to survive in any setting and situation. To do that, you’ve got to brush up on basic survival skills. These skills include how to build and tend to fire (with and without a lighter or matchsticks), navigating and reading a compass, building a shelter using materials available in your surroundings, finding and preparing food, tying a knot, and first aid. Learning these skills will help you fare better on the rough road and save you from sticky situations. It’s natural to feel apprehensive and unprepared for what lies ahead. Serious isn’t enough to describe the step you’re planning to take. You’re going way out of your comfort zone with only yourself to rely on and no safety nets to catch you in case a situation goes wrong. If you truly want this, whatever fear and uncertainties won’t be able to stop you. But you also shouldn’t move forward with your plan without taking care of your worries and fears. Don’t rush yourself, and gain more experience to build your confidence. Start small by traveling within your state. When you’re ready, go beyond the borders of your home state then, eventually, your country. This is just another way you prepare yourself for the bigger world. Congratulations for making the difficult decision to chase your passions! You’re very courageous and praise-worthy for going after what you want. There are countless reasons you should not take the risk, but don’t let them stop you. With ample planning and preparation, you can lessen these risks and be successful in your endeavor. Keep in mind the tips above and be firm and confident. Safe travels to you! Do you have personal stories and tips from your bicycling adventures? We’d love to hear them! Share your stories and tips in the comments section below.